A fully sponsored trip to the New York Stock Exchange for the finals of the 2012 Global Student Entrepreneur Awards (GSEA) awaits Ang Kevin, winner of GSEA Malaysia, a premier competition for students that own and run businesses while attending a high school, college or university. 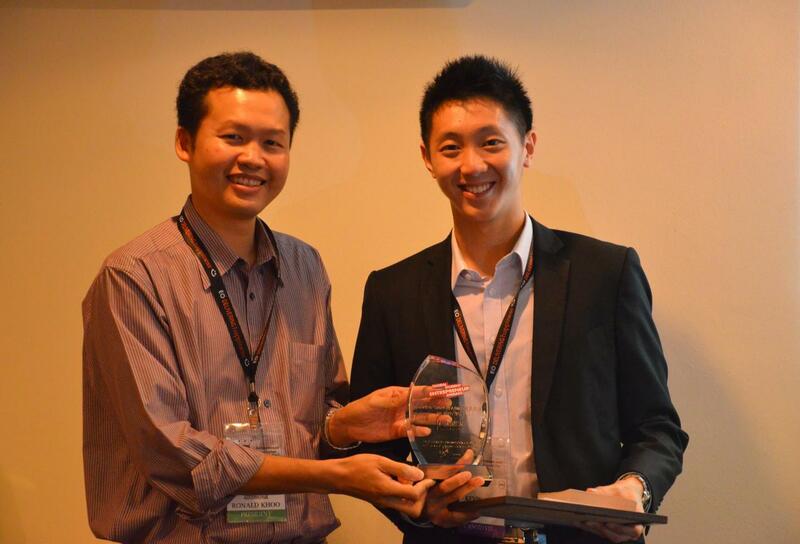 Ang Kevin (right) receiving the winner’s trophy from Ronald Khoo, President of Entrepreneurs’ Organization (EO) which operates GSEA. “And that’s exactly what we are selling despite the difference in products, packaging, and other aspects concerned,” explained Ang whose sharing platform, AwesomePenang.com, recommends the most ‘awesome’ food, places and events in Penang and empowers local merchants by allowing them to directly advertise and communicate to their target markets. “I have come to realize that simplicity is the ultimate sophistication and businesses should be able to clearly convey the vision of their company or product in a simple, easily understandable way,” said Ang, who wants to learn fast from top business leaders in the world, many of them in New York where he is heading in November. Seeing himself as an entrepreneur ‘who strives to put a dent in the universe’, Ang finds passion in building companies and products that help solve problems. AwesomePenang.com is his second registered business and he is deeply appreciative of the support he and his peers have received from INTI. “Throughout my time as an active student leader INTI has been really supportive of students’ initiatives and talent development. We are given the chance to take action and do things that are different from the norm, thus giving rise to the spirit of innovation and entrepreneurism,” he said. Ang’s advice to budding entrepreneurs is to start early and not be afraid to fail. “Learn fast, and learn every day. That is something I remind myself every day as change is the only thing constant in this world,” he said. Students of INTI benefit not only from the institution’s over 25 years of experience and strong track-record, but also gain from the global synergy and resources that Laureate International Universities provides. INTI is part of Laureate, which has a presence in 29 countries, with more than 60 accredited campus-based and online universities and 130 campuses, serving over 740,000 students globally. For further information on INTI and its range of programmes, please call 04-631 0138 / 03-5623 2800 / 06-798 2000.